The pictures did not truly reflect the Pine Lodge. The actual lodge was a lot smaller than expected. Having two children and a dog; at times the main living area was very over crowded. My only concern was that there is a small area of grass, however the children was not allowed to play ball games. I understand the safety elements as the properties are on the edge of a cliff. However, as long as they are supervised I could not see the concern. Thank you for your review. Sorry that you did not find our log cabin to the size that you required, it is a standard size for this type of accommodation. 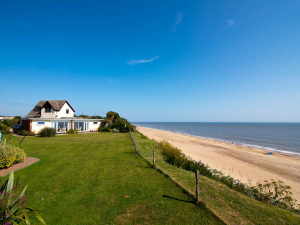 Wakefield Court Beach is for families that prefer a quieter type of seaside holiday and over our 28 years experience here, our guests tell us they prefer no ball games, as the adjoining sandy beach has plenty of room for ball games. Nick Sampson Proprietor.